A federal district court in New York ruled Wednesday that the American Society of Composers, Authors and Publishers is owed “reasonable license fees” by online media powerhouses AOL, RealNetworks, and Yahoo for the music streamed and distributed on their sites. Currently, music streamed by sites owned by the three companies is advertising-supported and no dividends are paid to ASCAP. The license fees would cover music distributed as early as July 1, 2002, and then up through the end of 2009. Because songwriters and composers often aren’t affiliated with record labels that distribute their music as performed by another artist, they presently are left without licensing fees from digital distribution on the three companies named in the court decision. The court’s finding represents a major step toward proper valuation of the music contributions of songwriters, composers and publishers to these types of online businesses. Modern devices help to imagine yourself a painter or musician. But if you have enough creativity, there are five equipments to feel yourself a part of the world of art. Thanks to the latest devices and technologies almost everyone can be called an artist. Nowadays it is so easy and pleasant to realize your creative ideas. The following gadgets will help you with that, but, anyway, don’t forget that you need enough patience and talent. 1. If you like drawing but it is really annoying for you to buy all the necessary tools, like tones of paper, pens, pencils, paints, then Wacom’s graphic tablets will easily resolve the problems and guarantee you just pleasure while working with them. Wacom tablets start from the budget-friendly Bamboo series (starting at ) to the most advanced Cintiq line (which tops out at 99). Anyway, the principle of the work is the same: while drawing with a stylus on the tablet, it will display directly all the gestures on the screen. The gadget gives the possibility and provides the most natural way to draw on a computer. With the help of the eraser on the end of the stylus you will be able to correct your picture very neatly. The stylus is a great tool; it can draw thicker or thinner lines according to the pressure. Moreover, it can even alter your pictures depending on your software. 2. Another kind of art that you may also study is stop-motion animation. As a result, you can make your own collection of the works of this interesting art of animating using real-world objects instead of drawings. The technology is very simple: at first take a picture of an object, then move it a little and take one more picture, etc. Then, if you play the still frames back, your object will become alive. If you are a fan of these works of art, then you should know that it is so hard to keep the same approach how you moved the object in the previous picture. In such situation Nikon will help you. The majority of the company’s budget-friendly Coolpix digital cameras have stop-motion function. You have to activate it just once, and the camera overlays dim versions of the previous pictures on the LCD preview. The feature gives you the possibility easily to line up the next snapshot. After your first work of art, the camera will automatically assemble the pictures into a QuickTime file. 3. If you have a desire to create your own action film on independent labels without spending much money, you can realize it. But you will definitely face the problem while choosing a camera. Every extreme scene will need its own camera: one should be for scuba-diving scene, another one for fighting scenes, and so on. So, you need all-in-one but not too expensive camera. Panasonic’s line of cameras based on SD Card has the water-resistant 9 SDR-S10P1 and the 9 SDR-SW20, which is waterproof, shockproof, and dustproof. Both of them feature shooting wide-screen video. The cameras will help you to create your own extreme films. 4. The Percussion Tubes and the Keyboard Experience are the result of development of modern technologies of ToyQuest’s partnership with the Blue Man Group. The Percussion Tubes are an order of eight motion-sensitive tubes you may play. They also feature inequable volume and tempo you can influence by waving your hands in the air above them. Actually, you can use the included drumsticks, but isn’t the first variant more interesting? The Keyboard Experience has two tubes and includes a 37-key synthesizer. Both devices have an input for an MP3 player, a recording mode and an audio-out jack. 5. If you are a DJ, then you should have a lot of devices, such as turntables, a microphone and an interesting collection of records. Scratches have always been the main problem. That’s why MixMeister is one of the companies that make DJ software, but MixMeister Scratch might be the only truly portable scratching tool you’ll find. It runs on the iPhone or the iPod Touch. All you have to do is to play a song from your great collection, choose a scratch type, spin the song on the screen and enjoy your favorite music. Ever see those kids blasting their iPods by turning their headphones inside out and turning them into makeshift speakers? The sound is so distorted at that level that I wish they’d just bring back the old school boombox and share music properly. 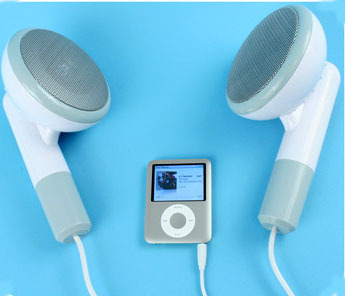 Or you could give those kids a taste of their own medicine and poke a little fun too, by using giant earbud speakers. These oversize speakers provide big sound and big laughs. They take 3 AAA batteries and work with any audio player with a standard audio jack. The giant earbud speakers are $60.